This is a very addictive combination. So easy to make and have on hand – Bright, refreshing and savory all at once. This is a cilantro lovers salad. Dress with about 2 Tablespoons of the dressing below. Combine in a glass jar, shake to combine – reserve extra for future use. 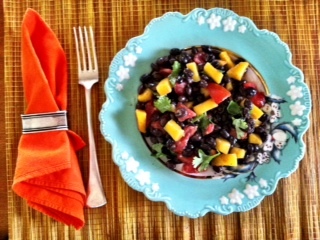 This entry was posted in Recipes and tagged Black Beans, Cilantro, Mango, salad, Tomatoes. Bookmark the permalink.